What wonders await bot, Mu and Yuki in the Cave Bunny’s abode? Well, “wonders” and/or “deadly terrors.” Either way, we’ll find out soon! Also, check out my blog post reflecting on last week’s San Diego Comic-Con! You’ll find a chance to win an exclusive SDCC BOTton secreted away at the end. Check it: SDCC Aftermath + Contest. it would indeed, f_f. i wonder how the headstone would read? “Never Trust Cave Bunnies,” perhaps? He needs the Scarf or a Holy hand grenade 🙂 Glad your back! which is exactly why he better not get eaten, Kanashe! I like the whistling in the dark attitude. ooh, yeah – that would be very bad, Insectoid. as if bot’s predicament couldn’t be even more dangerous: a dynamite rabbit! with big sharp pointy teeth! ha! what’s he do, nibble your bum? Glad to see that BOT is throwing away his fear and takes things as they come. Or he is desperate. Either way works, as things do not look good for BOT and Friends. I hope the last thing the bunny says is: It’s dangerous to go alone! Take this! i think bot’s a bit of both, Graypatch, as he doesn’t have many options right now with Musashi out of commission. and, yeah: if the bunny gives him an upgraded sword and shield (and/or boomerang!) that’d be optimal. heheh. Would that be an adorable death? Growlers… At least there is official name now but i thought some suggestions from fans were better. …Just saying. curious as to what suggestions you liked better, Maryz? hopefully “Growlers” will grow on you. There were few more but these were most original IMO. PS: I like Mutapets most obviously – since I came up with that one. I don’t think it would make sense for Jefbot to start calling them Ebils or Chinhillators or Mutapets all of a sudden. I think he calls them Growlers because he’s trying to come up with a word to describe them but he doesn’t know what they are. IMHO. I don’t mind the Growlers name. But it HAS been some time since they were introduced into story and I was thinking about them as Mutated abductees of pet origin for a while now. It’s gonna take some time for me to adjust, that’s all. that’s exactly what i was going for, Near DN – bot’s just calling them “Growlers” as a general name to describe the creatures (because they’re always growling), so it’s not their “official” designation. Yay, I’m glad he decided to go for it. I have a feeling it was a good choice. The cave bunny certainly could have killed/eaten them already if he had wanted to, and cave bunnies don’t strike me as the kind of creature who would just be playing with them before eating them. I’m glad you’re back Jeff. Sounds like you had a great (if extremely busy and tiring) time with the cons! That’d be an epitaph for the Ripley’s Believe It or Not Museum collection. The Ripley’s museum in Atlantic City, New Jersey has a collection of strange epitaphs anyway. sounds cool, Rainey! i might have to google those epitaphs, now. Yeah as far as deaths go, that’s a pretty crappy one Bot. let’s hope it doesn’t come to that, blackjacket42! Hopefully the above does not happen, as it would kinda mean the end of a great webcomic. Bless this holy hand grenade, that it may blow thy enemies to smithereens! it’s one of the sacred relics brother maynard carries with him! aack. i can imagine, TPC – my sister, Linda, had rabbits as pets and whenever they yawned you could see their vicious little teeth! glad you escaped with all your digits intact. Silly bot. Giant cave (hermit yoda) bunny are never scary. until they sink their giant incisors into you, Jf#300! just get back on the road and when the growlers come run like hell and just try to find a dinier of gas station or somewhere to hide!!!!! 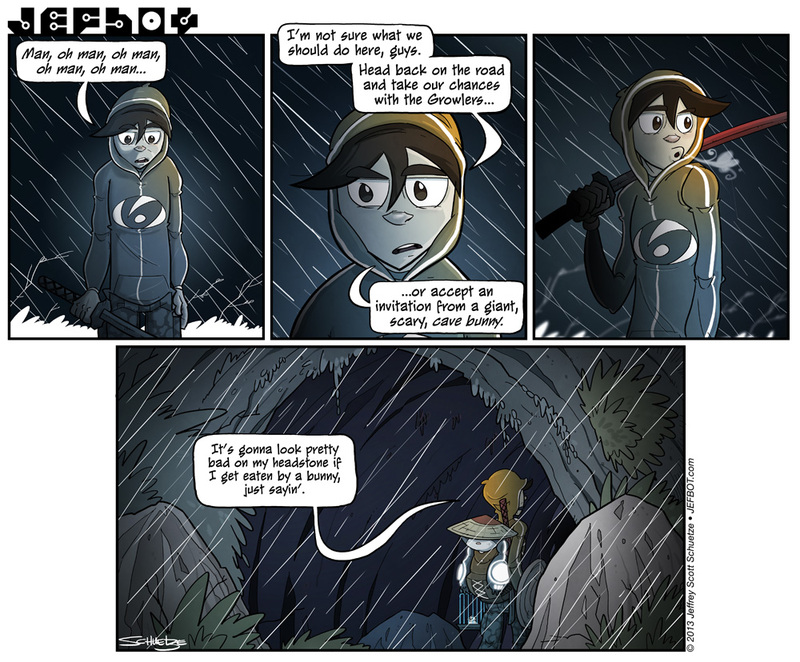 awesome comic i like how you draw rain!!!!!!! well, even though you’re gonna have to wait for each installment to come out now, thanks for reading through the archive, Some guy! To be fair, that’s not just a bunny. That’s a BAMFbunny. true dat, Sarah W. and you don’t mess around BAMFbunnies. Good to have you back Jeff. thanks, PJ! feels good to be back, writing and drawing and hanging out with y’all again! Lovely rabbit!! I too used to wodner how people could create something just by folding a piece of paper. As I have practiced it, I find that origami is a bit like music or like painting. We learn the basics notes or color combinations, and little by little we start to add “vocabulary” until one day we are able to do something on our own.